There is only one thing to do when the weather is foul and that’s to pack your bags and go to where it’s sunny and warm…. Yes, I have been away. I am back now in rainy North Devon. Even when the weather forecast is poor for Cornwall it never seems to materialise and it’s always glorious… I have tampered with the colour in only one of these pictures. Anyhow, it is competition time!!!!! Your mission, should you choose to accept, is to pick out the photo that I’ve enhanced. 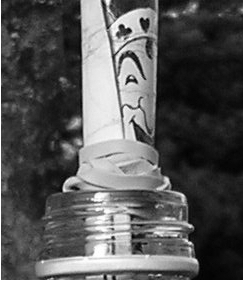 The prize is a calligraphed envelope with your address and some Wonky Words of your very own to keep…. what could be more lovely??? Other than a cream tea and a Cornish Pasty. Meanwhile, please bear with me whilst I upload 322 more photographs of the Atlantic Ocean. 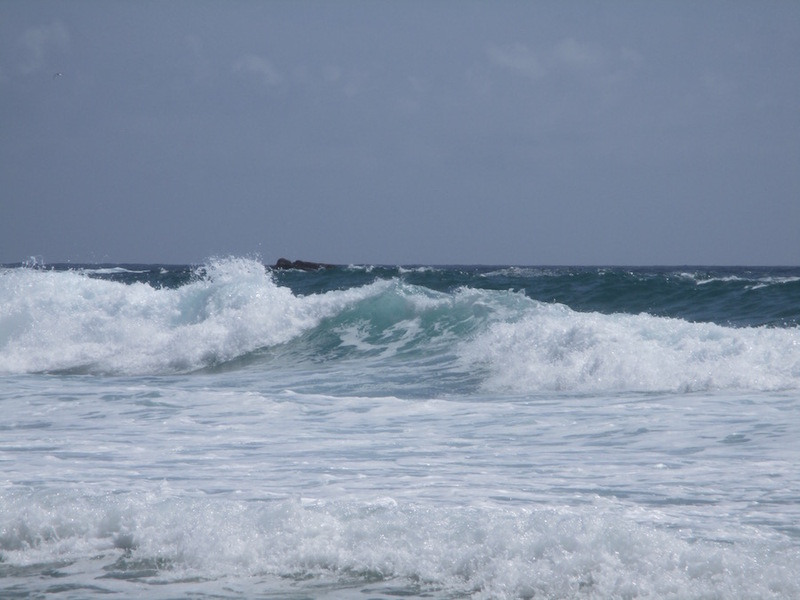 This entry was posted in Personal and tagged competition, Cornwall, holiday, obsessed with taking photographs of the sea on July 8, 2015 by Scarlet. Well! I have to say that Carbis Bay 1 looks about the same colour as the view from my local watering hole. 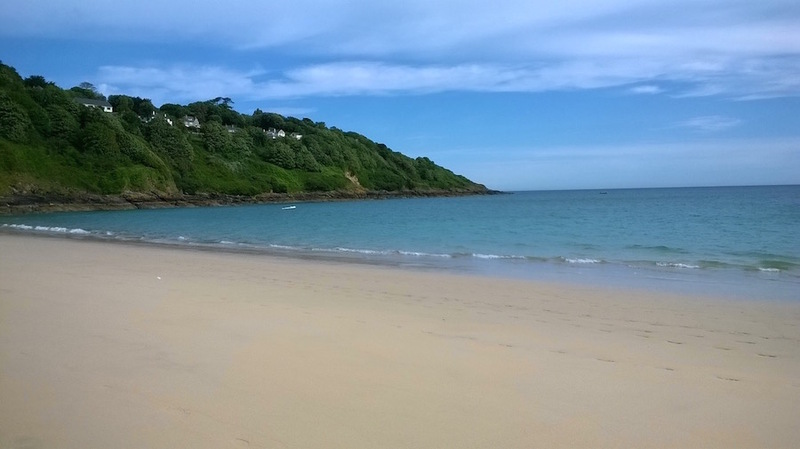 But the again…my local watering hole sometimes looks like Carbis Bay 2. Perhaps, if you took a holiday in, oh, I dunno, Crete? McMurdo Sound? That might make things a little easier. Of course, the Big Thing is …did you have a jolly time? Lots of crumpets an’ creamy things? Yes? I had a fab time, Dinah!! And I had cake every single day… sometimes I had more than just one slice. Thankfully I did plenty of walking, so no real harm done. Ohhh…I love a good contest! As long as it’s a fair fight. And what a fantastic prize! Original artwork! Here goes nothing. My guess is the first pic. Those greens are highly suspect. “more waves” is my pick! Friends in Cornwall say it has been a good summer. We are in a drought here in ‘SoFlo’ (South Florida) which translates to very high water bills. Results to be posted next Wednesday, Grouchy! We haven’t had a drought in years…. maybe 2010?? And that was due to a cold, dry winter! What lovely holiday pix! I hope you had a wonderfully refreshing time! 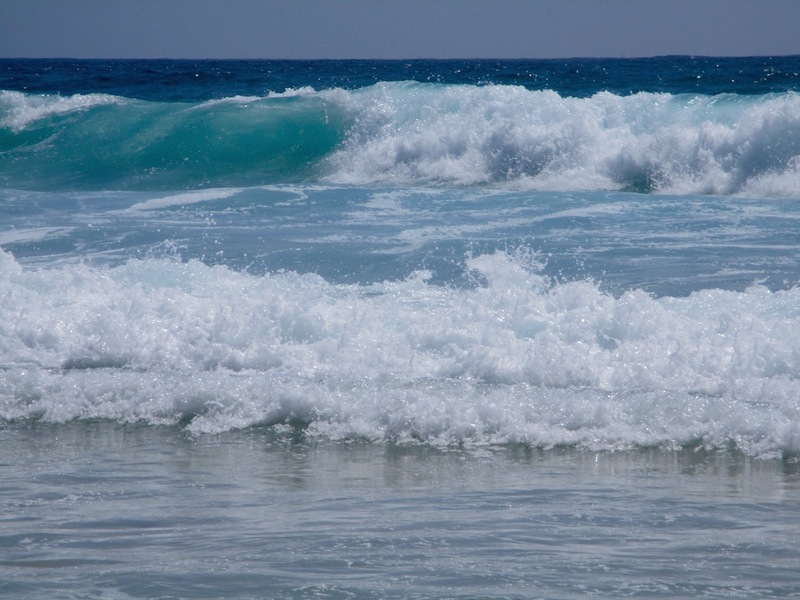 “More waves, Porthcurno” is my guess. Did I win yet? PS: Now I’m in a sulk that I haven’t been to the beach in ages for Coconut Shrimp and Hush Puppies. Results to be posted next Wednesday, Mr Lax!! Oh, get to the beach! I need to go at least five times a year, and Cornwall is special – such amazing light. Well, that was my kind of holiday without a doubt, and I’m really glad you had a great time. Ooh the competition. As you know I’m a driven competitive man, and winning things is one of my main interests. When the winning also involves active jaw exercise I’m thrown into a frenzy but then my answer, right or wrong, is the same as other people’s so what happens then. This could be one for the umpires. Oh, you want the answer I hear your cry. Why photo one of course. The sky is impossibly blue and their is no litter on the beach ! I’m sure people litter pick the beaches in Cornwall, as they are unbelievably clean; it’s in their interests to keep them this way as the economy is so reliant on the tourist industry – get yourself down there! What a lovely place to be away in! I’ve only been to Cornwall once, but it was absolutely marvellous! I keep meaning to go again, and these photos are getting me another step closer. And as for the photos, to my colourblind eyes, ‘Carbis Bay 1’ or ‘More Waves, Porthcurno’ look more colourful, so I’m going with the popular choice of ‘Carbis Bay 1’. P.S. 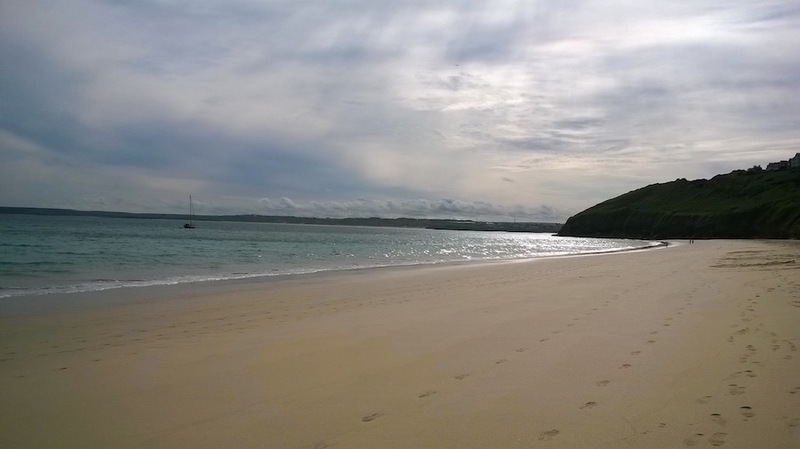 Are any of those footprints in ‘Carbis Bay 2’ yours? Mr Devine – I believe the footprints must be mine! I messed up the virgin sand! Get yourself down to Cornwall, we can meet for a cream tea, it will be glorious! The first picture looks as though it came out of a holiday brochure, it’s the Britain I yearn for. I can feel the salty spray caking my face as I type. Yes, Ms Carte, Cornwall can occasionally deliver the Britain you yearn for. It’s so quaint. The salty spray you speak of is as effective as hair gel – who knew?!! Oh this looks very nice ! I had to google the places and read about them. Did you visit the museum ? Are the underground tunnels accessible ? As for the photograph – I have not decided yet, later. “tampered” – hmm, that could mean changing it to brighten or dull. I’ll take the contrarian’s view and say it’s the Carbis Bay 2 pic. No need to mail any prize. Just recognition on your site is reward enough. Beside if you mailed something to me, MI6 would probably find out my location. A competition !!! This is exciting !!! Awww! You have a way with words, Leni! 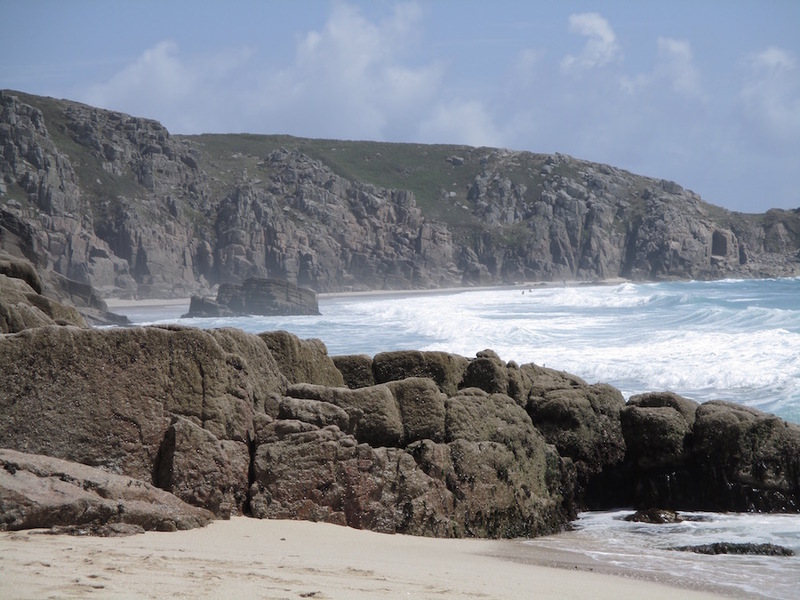 I loved Cornwall when I visited, though the weather did not return the favour. I’m voting for Carbis Bay 2, if I’m not too late to the competition? You are never too late, Ms Rose! I can’t get enough of Cornwall… one day I will move there, it’s my dream. It’s the one with the cat playing the violin on the broken chair. Definitely. It’s always the one with the cat. Ms Tara, you are spot on! And the only one of my commenters to see the cat – remarkable! Yep, it was lovely down there….. and now it’s all a bit murky and rainy… we have to pay for good weather, don’t we?! I’m just glad you got away for a nice little break in reasonably good weather… Here we are in the midst of winter, pouring with rain(Yay! we were having a mini drought) and battling 10 and below temperatures every day. Roll on summer I say! Oh Princess, don’t break the illusion… to us Brits Australia is always wall to wall sunshine! Nothing like messing up the virgin sand. 😉 I guess number 1. Regarding the picture – I’m with Princess, and say it’s the last one “Where to next? 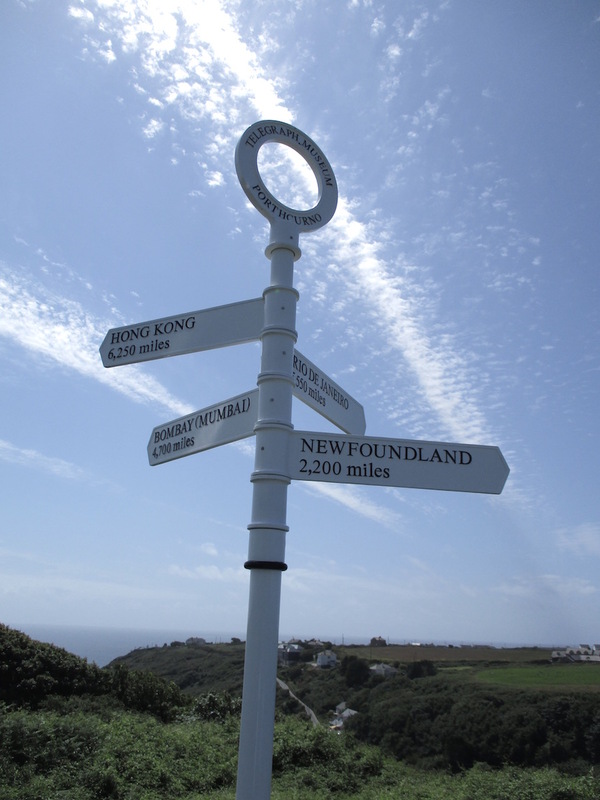 Porthcurno Telegraph Museum”, because the text on the signs is so very sharp, I think you played with contrast. Now I want cream tea and a Cornish pasty. Ms Mistress… So do I!!! It was deliciously beautiful, Ms HP…. and it’s not so far from you, it’s a nice journey too. Ghastly here today – like Autumn. Oh my, I’m so late (again). Looks like I’ve got plenty of catching up to do. I hope you had someone to care for Charmaine and that flamenco dancer (what’s his name… Harvey???) whilst you were pleasuring yourself in Cornwall. Would you believe that I never saw the ocean in my life? P.S Oh no! I couldn’t live without seeing the ocean – you are missing a treat, Jon. Ah, St Ives and Carbis Bay, a lovely part of the world. I hope you went to Tate St Ives while you were there. I would say the enhanced pic is Carbis Bay 1. The blues look a little too intense to be real. And very different from Carbis Bay 2. Or it might be the one with the rabbit playing the guitar on the sunbed. Again, another commenter looking at the finer detail in the pictures – it was no mean feat capturing that rabbit on camera.